Butter London St. Paddy's Day Freebie! Here's a nice little freebie from Butter London! 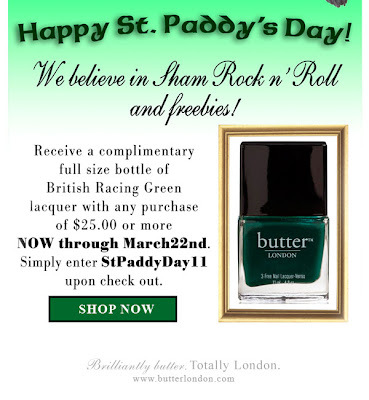 Receive a free full-sized bottle of British Racing Green with any purchase of $25.00 or more. I can't get this to work, it says maximum redemption or something in the error code. Anyone had any luck? I'm getting the same message. :-( I'd hope we're not too late when the promo was supposed to go until the 22nd! I emailed them on their contact form, but no idea when to expect an answer. Too bad they don't have a phone number or a live chat option! I emailed them and just got this response. I also tried the code and it's working now! Thank you so much for your email! The coupon code has been fixed and is now working properly. Please enter StPaddyDay11 upon check out again for success. Jessica~we all thank you for your efforts and for taking the time to let us know! No problem! Thank YOU for letting us know. I'm just glad we can use it and they responded so fast!